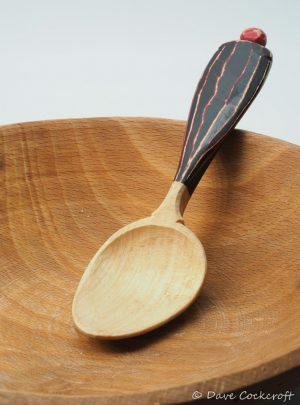 I sometimes use milk paint to colour the handle of spoons. 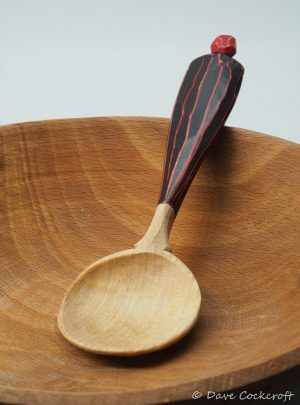 The most popular painted handle I make is a black over red combination that is then rubbed back to distress the high points, the ridges between the facets and the edges of the handle. 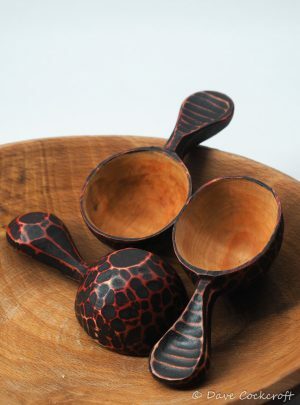 The first batch of these I made back in 2016 at Spoonfest were very well received and dubbed lava spoons as the glowing red shows through the black and looks red hot (maybe). 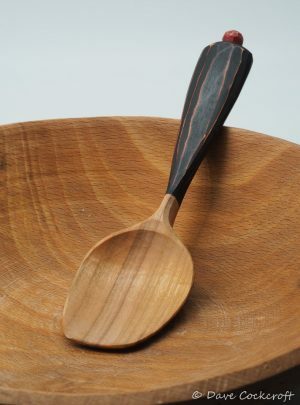 Anyway the name has stuck although the look of them has changed a bit as they now have stripes running along the facets on the top of the handle. 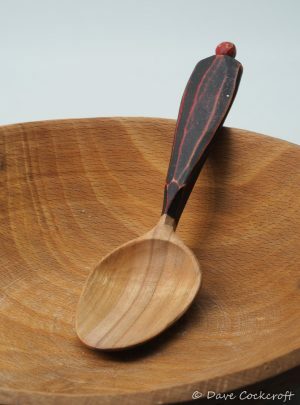 A sycamore eating spoon with my special red and black milk paint finish, folks at Spoonfest called them lavaspoons and the name has stuck. 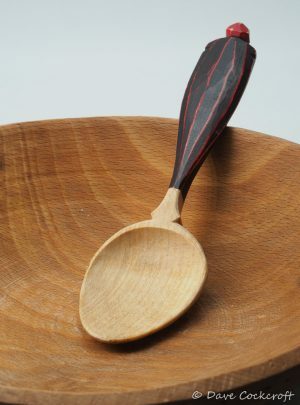 A sycamore eating spoon with my special red and black milk paint finish and an almost round bowl, folks at Spoonfest called them lavaspoons and the name has stuck. 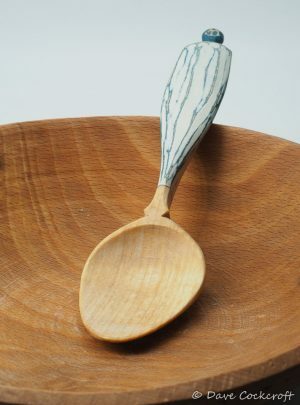 A sycamore eating spoon with a blue and white milk paint handle, inspired by ripples on the sea. 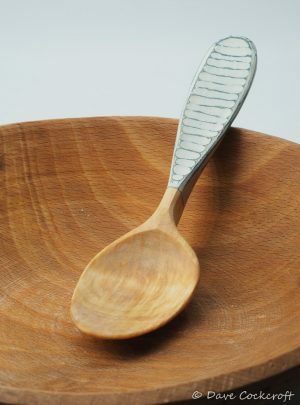 Hence the name, seaspoon – it’s not a teaspoon, it’s a seaspoon. 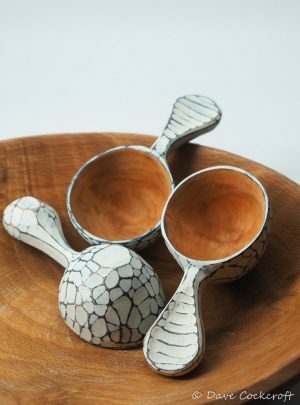 The top surface of the handle is slightly hollowed and those little ripples are for your thumb to explore. 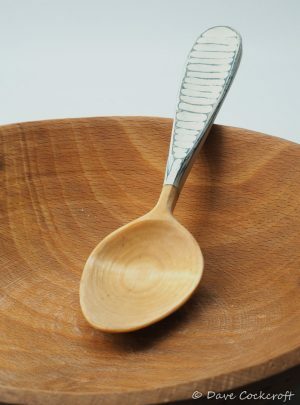 A different patterned seaspoon. This one has the shave of a lavaspoon with the colour of a seaspoon. Likely a one off experiment, unless folk demand more like this.